Mary, assisted by Anna, plans an assignation with Tony Gillingham. Charles Blake realizes Mary has chosen Gillingham and comes to Downton so they can talk. (Picture of Mary and Charles, above.) Edith steps in as a sort of godmother to Baby Marigold, so she can stay in her life. Isobel and the Dowager Countess visit with Lord Merton. A policeman comes to the Abbey with news that there was a witness in Mr. Green's mysterious death. Lady Mary boldly moves forward in her plans to have a tryst with Lord Gillingham, checking into a Liverpool hotel on her own and meeting him in an adjoining room. She plans birth control (with Anna's help) and moves forward in secret, trying to plan her own future and happiness. This is the most determined we have seen her to move forward since Matthew's death. 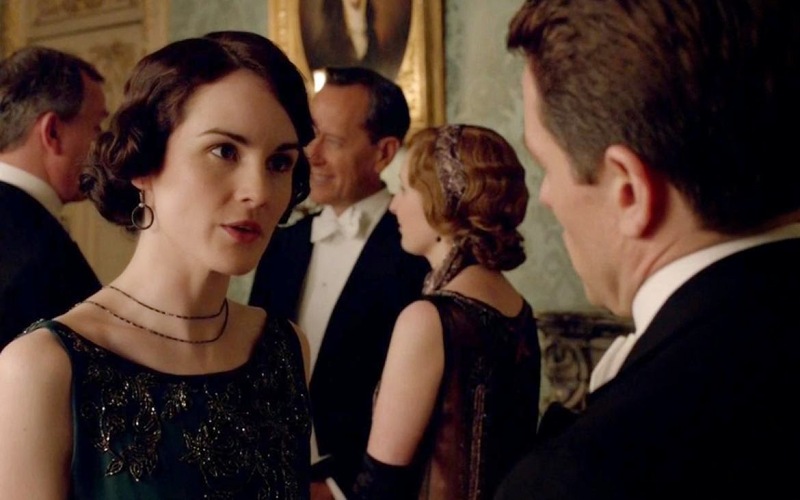 The wireless comes to Downton Abbey. Not surprisingly, Rose advocates the wireless radio, while Robert and Carson oppose the idea. The family and staff are amazed by the wireless - progress before their eyes. Daisy comments: "Why is it called a wireless when there are so many wires?" It was truly surprising to hear that there was a witness in Mr. Green's murder. Mrs. Hughes looks shocked - and troubled - by the news, since she suspects that Mr. Bates had something to do with the murder. 1. Maybe if Thomas found love, he would be a nicer person. I actually felt for him in this episode, as he seemed very lonely. 2. I do not think Mary should have asked Anna to pick up the birth control, when Anna was clearly uncomfortable doing so. 3. Although I have liked Tony so far, I did not like his thoughts to Mary on how to lie successfully. Now I am wondering if he should be trusted. The trailer for next week's show teases the appearance of a man from the Dowager Countess's past (!!). Mary is moving forward - hopefully toward happiness. I hope that things move smoothly for Edith with baby Marigold, but Drew's wife does not seem as amenable to the plans as her husband. And what of the new arrival, Simon Bricker? He seems interested in flirting with Cora. What did you think of tonight's episode? What did you consider the "oh my" moment? And what would you like to see happen next? I love this show! I'm really worried about Mr. Bates getting in trouble for killing MR. Green, even though we don't know for sure that he did it. I am worried about Mr. Bates, too! I would love to see he and Anna have some happiness at last. I just love Downton. I can't wait to see what's going to happen in this season. Kristin, I agree about Mr. Bates! I liked Gillingham last season but am not sure about him now. I did not like his speech to Mary about how to successfully lie this week. That raised a huge red flag with me. I haven't' watched the new seasons-- I'm so behind I need to play catch up!